It’s been a few days since I’ve posted any Project 365 photos but I’ve been taking them and haven’t missed a day. Last week I came down sick with a sore throat and fever. That subsided after a day and I thought all was well but then it came back with a vengence and turned into a full blown sinus infection complete with a lingering low grade fever. It must be the change in the weather. But despite feeling quite under the weather I kept up with taking my daily photo, I just didn’t spend any time on the computer processing them until today. While I am still not 100% I am feeling much better. Still, I am quite thankful that tomorrow is Friday and the weekend is at hand. This first image was taken in our backyard after a day of rain. 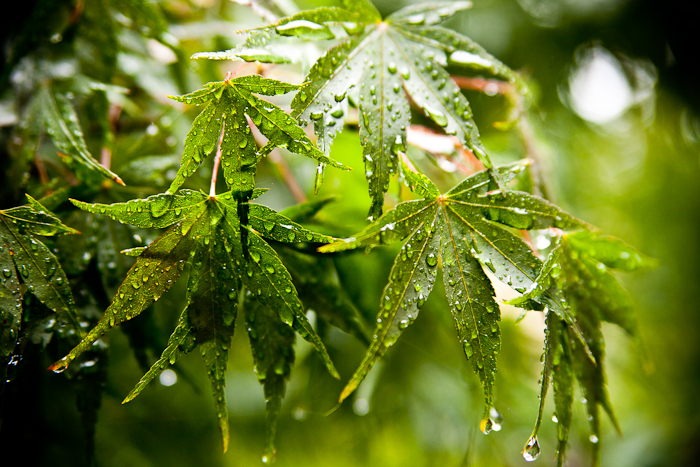 I ran out inbetween showers and caught the drops of water beading up on the leaves. I used my Tamron 28-75 which has a macro feature on it but really it’s not a true macro lens. It’s shots like these that really make me want to get a true macro. Day 234 was a day when I definitely wasn’t feeling well so I was really grasping at straws for a fun shot. Then I saw one of those stupid Progressive commercials where the lady gives the customer some “calculator humor”. 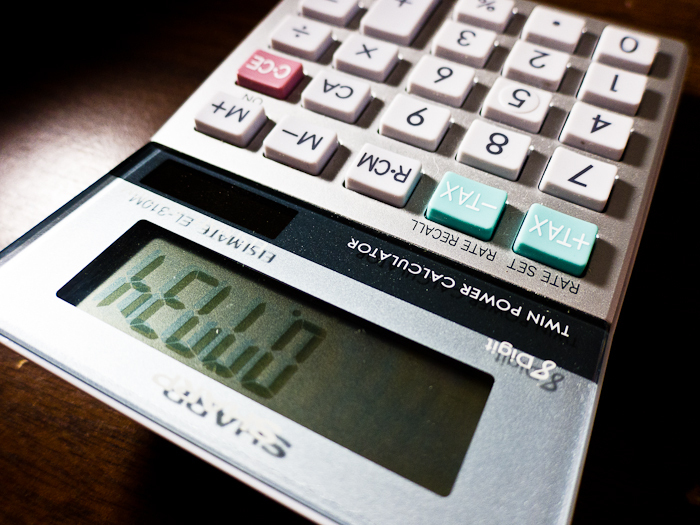 So I did the same with my own non-fancy calculator.I shot this one with my trusty Canon S90 point and shoot and used a light directly camera left and slightly above the calculator. I really like how this one came out. In fact it’s one of my favorite shots despite the “cheesiness”. Next day (Day 235) was more fever day. This was probably the worst feeling day of the bunch. I actually worked this day and all day I had chills despite being in a warm office. 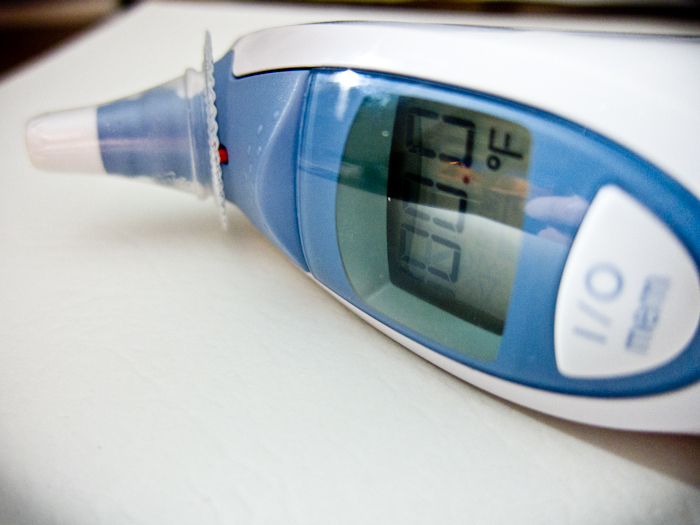 When I got home I checked my temperature and sure enough was running a low grade fever. I took this quick no thrills shot and then went straight to bed. I really wasn’t expecting much and at that point really didn’t care. But I got my shot and it actually turned out fairly decent. 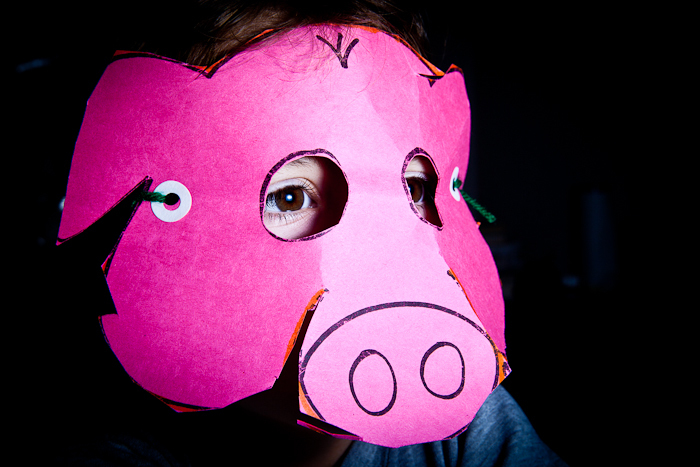 Day 236 featured my youngest son and the pig mask that he made in school. He came home very proud of his pig mask and was more than happy to oblige a few photos. For this I setup my Canon 580EXII and put the Lumiquest Softbox III on it and dialed the power way down so that I would only light the mask and not the background.What I love about this shot (besides it being my son and his great mask) is how the eyes are lit up behind the mask. I just really like this shot. Finally, today (Day 237) I had a scheduled day off because I volunteered at my sons school to go on the annual field trip to the pumpkin patch. It’s always a lot of fun with the kids as long as the weather is nice. And boy was it ever nice today! Blue skies and warm temperatures. Just a perfect day to be out hunting pumpkins. My son found one perfect for him and on the way out we also picked up some fresh produce. 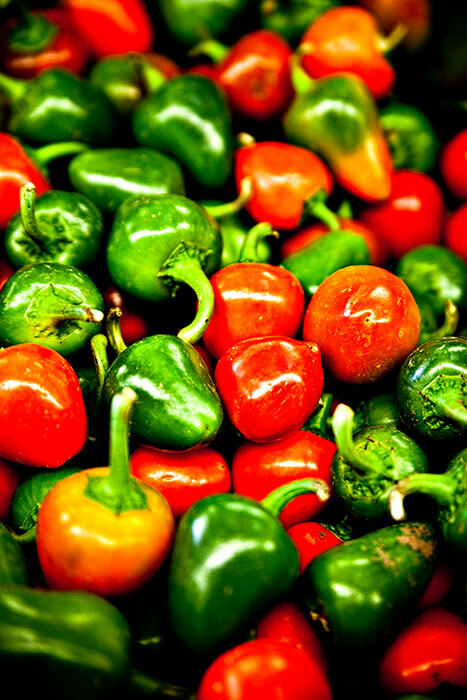 I managed to snap this shot of some colorful small peppers.